In addition to the Fish on a Stick vendors, I did a lot of street food dining this time around. I heard about a guy named Eric Wichner from Philly that had moved to PV and started a business offering tours of local street food vendors that had been vetted as “safe”, but still offered a real local taste of the food and culture. Eric’s company offers two or three different tours that I would say are a must for any visiting LTHer. The tour I went on was called Tacos and More and was a 3 ½ hour walking tour of a bunch of different street vendors and other local food shops. Our tour was led by the lovely Chacha, a Mexico City native who moved to PV several years ago. Chacha is bilingual and, more importantly, a local who has built up relationships with most of the different vendors we visited. The one thing missing from this tour is any kind of map that shows you where you’ve been. Most of these places don’t have street addresses per se, let alone names, so although I was able to revisit a few of them during my visit, there were a couple of places that I never did find again, despite really looking. As a result, I’m not able to list addresses or street corners for any place we visited. Next time, I’ll pay closer attention and take notes. First up; birria. The first stand we visited served beef birria. I thought it a little odd that they weren’t serving goat, and at first I thought it was in deference to us Gringos, but according to Chacha, goat birria is not all that common in PV. 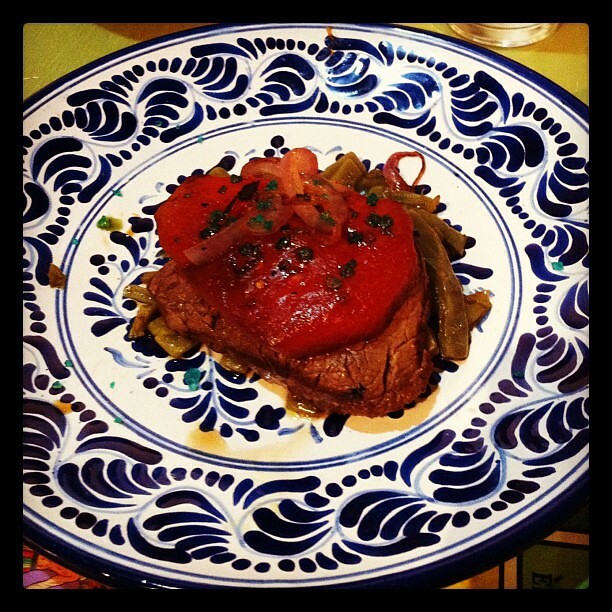 Beef is the birria of choice and there are even one or two places that serve chicken birria. After downing my taco, the proprietor of the stand ladled out some of the broth. Let me tell you, this was some excellent broth...some of the best I have ever tasted. It was very rich and flavorful, obviously made with lots of good bones and the time it takes to coax the flavor out of them, with just enough background heat to make it interesting. Next up was a carnitas break from the little stand called Taqueria El Güero. Like all of the tacos I tried in PV, I‘ve had better, but these were pretty good and really hit the spot. At this stand, I once again encountered the chili oil-like salsa similar to the stuff they serve at Tino’s and here in Chicago at Los Gallos #2. Evidently, this condiment is common in the region, but has no known Asian connection. According to Chacha, it’s been made in this area going back a very long time and I encountered various versions of it in our travels. As we were leaving, I spotted these quietly hiding on the grill. I resisted trying one because we were only on our 2nd stop of many. In retrospect, I wish I had at least split one with my fellow tour participants, a nice couple from Albuquerque. By this time, we were getting a bit parched, so we stopped off at the local coconut stand where Senior Felix prepared a little refreshment for us. This guy has been using the same tree stump as a hacking table since it was at least 10” taller. If you look close, you can see where the paint is worn off the inside edge of the white support pole next to the stump. That’s how tall the stump was when he first got it. He told me that a stump will typically last him 5 years before needing to be replaced. Fresh coconut water is one of the most refreshing drinks I know. It has a nice subtle sweetness, but is not sweet like a fruit drink or soda pop. While we were enjoying the coconut water, Felix was scooping out the coconut meat. The scooped fresh coconut is then finished with a squeeze of lime and some powdered chile and eaten out of hand. 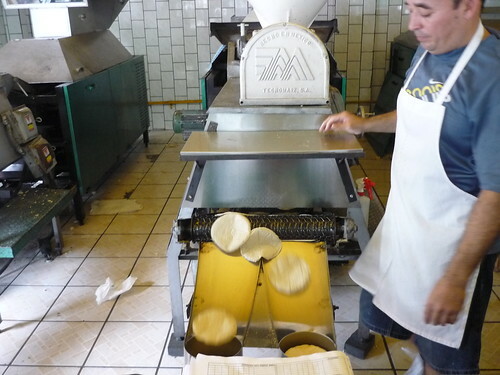 After that, we hiked a bit to visit a local tortilla factory. This place, Tortilleria Zapata starts with whole corn and mills their masa in house, then makes some very good 100% corn tortillas, which much to the dismay of the general populace, are getting more expensive every day and harder and harder to find. Lots of tortillerias are now making tortillas that have at least a small amount of flour added to the masa as a cost saving measure. We tried these with just a sprinkle of salt and rolled up like a cigar. The salt really brought out the taste of the corn. These were a surprisingly satisfying snack, although I did buy a bag of house made totopos to take back to the apartment for later snackage with some salsa and cerveza. 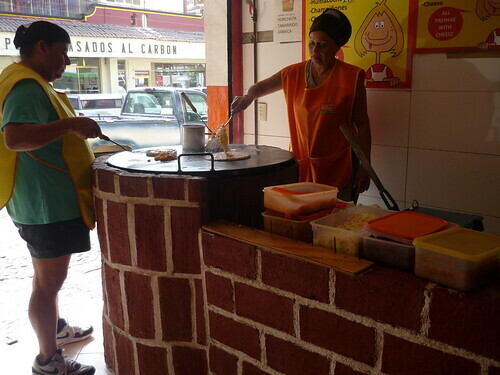 A number of businesses have sprung up around the tortilleria including this produce stand, called Fruteria Yoya, which features fresh from the farm merchandise every day. There are also a bunch of small farmer occupied stands and carts in a small courtyard in back of the tortilleria, such as this stand featuring “Freshly Killed Chickens”. When asked if her chickens are really freshly killed or if that is just a slogan to differentiate her from her competition, the chicken lady said that she really kills them fresh because if she killed them at the farm and then brought them into the city, it would be too expensive, considering the need for refrigeration on the drive in. This is an interesting contrast to Chicago where our farmers not only have to pre kill everything but also have to have it frozen solid before they can sell it to us at their market stalls. Next up, Taqueria El Moreno, another taco cart, for a quesadilla. Taqueria El Moreno was the only street stall I visited on this trip that featured tortillas hecho a mano. Each one was made to order beginning with pressing out the tortillas using an old manual tortilla press, and then laying them out on the plancha to cook. Though they don’t offer al pastor, this stand came the closest among any pace we visited by cooking their meat over charcoal. After a bit more walking around, we visited a couple of really interesting businesses owned by the same family. First, we visited a butcher shop called Carniceria Colon. This was one of the better butcher shops I saw on this visit, and would certainly be my butcher of choice if I lived in PV. The overall quality of meat wasn’t quite up to the standards of a Paulina or Joseph’s, etc. but the quality of service was. They did custom butchering as requested and their prices were pretty decent. Keep in mind that these are prices per kilo so, for example at the exchange rate in effect while we were there, steak was going for $2.56/lb. and hamburger was going for $1.78/lb. That’s not the real story of Carniceria Colon, though. They carry a motherload of carnitas. There’s a big serve yourself section of carnitas sorted by type of meat and you can mix and match to your heart’s content. And, for the crunch lovers, there’s an equally impressive selection of chicharrones available. The chicharrones were some of the tastiest I have had in recent memory…especially the pieces with nice bits of meat still attached. All of this porky goodness is cooked up in the back in three massive cauldrons. Although you always hear that copper is the traditional metal of choice for carnitas cauldrons, these seem to be aluminum or steel and are really big. Bigger than any I have seen in Chicago. To give you an idea of the size of these cauldrons, here is a shot of a couple plastic bags full of large pieces of chicarrones. Each of these bags is the skin of an entire pig in a single piece. The cauldrons are large enough to confeit a while pig without having to cut it up. 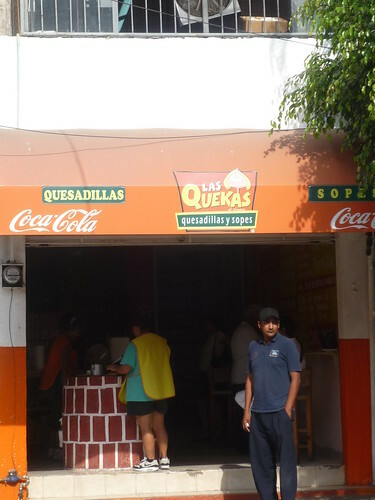 After the carniceria, we walked down the block to visit the family’s bakery, Panaderia Collins “El Casa de Baguette”. 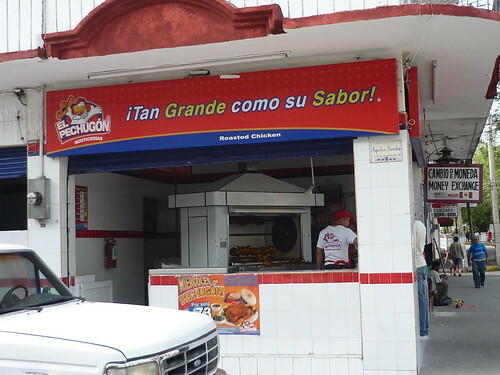 This is a large scale commercial bakery that turns out several types of bread and Mexican cookies every day. We got there too late to see anything actually being baked, but we did get a chance to check out their massive oven that had to be at least 20’ square. I wish we had gotten there earlier in the day to see this beast in action. It had been shut down for a couple of hours by the time we got there, yet you could still feel the heat radiating from the oven’s massive tile face from 10 feet away. By this time, we had been on our feet for quite a while, so Chacha took us to a little sit down place whose name I never even saw (if it had one). 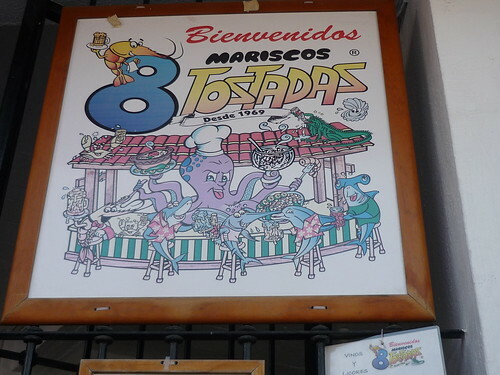 This place served us some seafood tostadas and a pineapple flavored drink. This no-name-place also served a version of the chili oil salsa that really packed a lot of heat; and in addition to that, had a similar onion based habanero salsa that packed even more heat than the chili oil version. I wish I could have found this place again because I wanted to explore the menu further. I have one more place on the tour to talk about. This place, called Mariscos Cisnaros, served up chile relleno tacos with a twist. Instead of using traditional poblano peppers, they use jalapenos that have been prepared in much the same way as an ABT and stuffed with a mixture of cheese and shrimp. The heat level on these really varies from pepper to pepper, so you never know when you’re going to get a really hot one. These were great. The one I was served wasn’t all that hot, but one of my tour mates got one that seemed to pack a bit of heat. Here, too, we ran into some of the chile oil style salsa, but also the green creamy salsa that has been discussed here on LTH Forum with ingredient guesses ranging from avocado to lettuce. 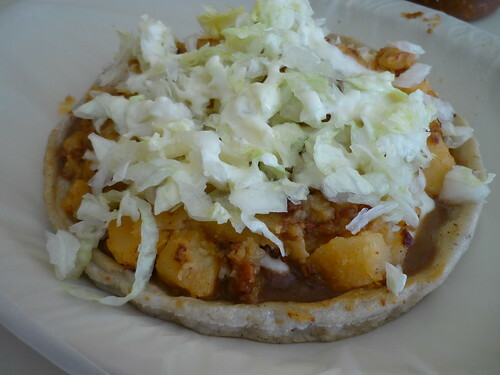 This version, and possibly the versions served on Lawrence Avenue, is made from the seeds and pulp from the hollowed out jalapenos and some mayo or crema. It’s creamy but packs a subtle heat and really good taste. By this time, nearly 3 ½ hours had passed and I was stuffed to the gills. We even visited a couple other places that I didn't post about. I had a great time on the tour, but it could have been even better if I wasn’t alone, so go with a friend. There were two other people on the tour with me, but even so, it would have been nice to have had someone else there with the same type of LTH Forum sensibilities to share some of the food and possibly to help me eat a few extra things that I just couldn’t manage by myself. 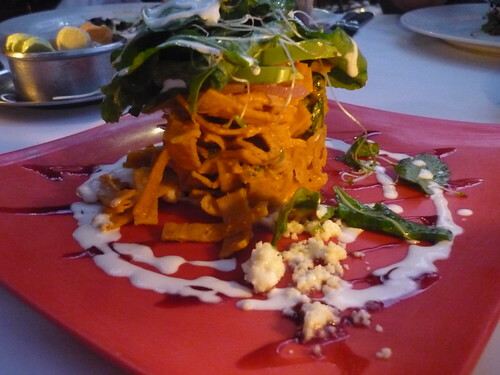 I’d say that taking a Vallarta Eats tour is a must for any serious foodie’s Puerto Vallarta visit. Next time, I plan on taking one of the more elaborate tours in the evening and maybe doing this one again just to find out for sure where some of the places we visited are located. If you end up on one of these tours, make sure you say hola from me. I've got one more thing to add. In the past, there has been some discussion about where to buy vanilla. The Chow Poodle bakes a lot, so one of our primary missions every time we go to PV is to restock her vanilla supply. 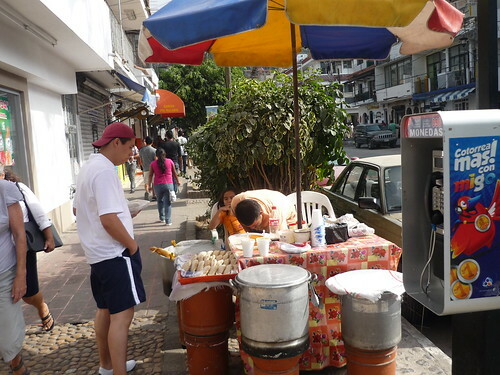 Vanilla is not hard to come by in Puerto Vallarta. It's available at nearly 2/3 of the shops in the flea market, at pharmacies, grocery stores and even airport shops. The problem is that a lot of it isn't very good; some of it isn't even really vanilla. Buyer beware. Through lots of research, we've settled on Orlando brand as our favorite, and we've now found the best place to buy it. 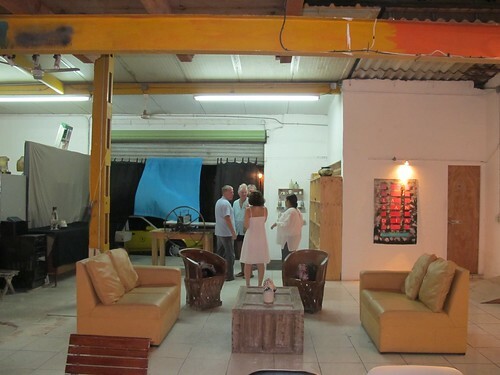 La Casa de La Vainilla is a tiny storefront located in back of the big parking structure on the Malecon; just around the corner from Banco Santander. Although our brand of vanilla can easily be found elsewhere, there's no telling how long the bottles have been sitting around. At the flea market we found some bottles that were heavily covered in dust, for example. That is not the case at La Casa de La Vainilla. They have a well stocked selection of liquid, powered and whole bean vanilla as well as other vanilla related products. I brought a jar of vanilla mole to the LTH Holiday Party as a raffle prize. They carry another brand called Gaya that they consider to be their premium product. It comes in a lovely sculptured bottle and smells great, but upon closer inspection of the ingredient list, it contains corn syrup and/or sugar. Not additives I am looking for in my vanilla, so we stick with the pure Orlando in both regular and clear for our vanilla needs. This little postage stamp of a store is worth seeking out if vanilla is on your shopping list. Thanks for sharing some great posts and pics. One note on Gaya vanilla, though. Through pure dumb luck, I guess, we bought a small bottle of Gaya vanilla last year. Absolutely terrific stuff--the best I've ever had, hands down. When I was looking to replace it, I posted here and searched the internet. Very hard to find. And, for what it may be worth, I examined the ingredient list carefully: no corn syrup, no sugar...no additives whatsoever. I'm puzzled by what you found; it seems odd that it would be the case with one size and not with another. But next time you go back, I'm sending you with money for more (non-additive) Gaya! 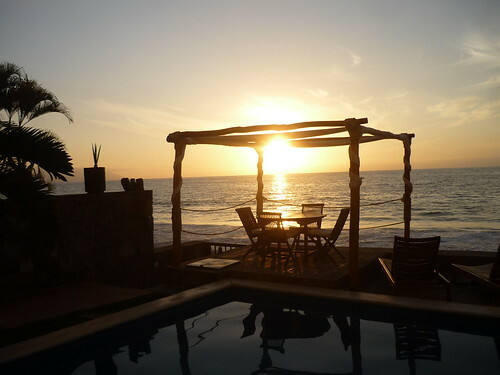 Another fantastic week in PV! This being our 3rd visit we have some old favorites but thanks to great suggestions by SteveZ, we've added to the collection. Sorry no pictures. Cueto's was our 1st dinner and every bit as delicious as last year's seafood feast. Wonderful snapper, lobster, huge prawns, and seafood cocktails. It’s replaced Tino’s as our go to 1st night dinner, which I hear is a little tired. Café des Artistes had been our upscale dinner of the week, but we all felt last year’s meal was lacking so we tried La Leche instead and it was a great experience. The outdoor tables in back have a tropical feel and are much quieter than the main restaurant. The menu supposedly changes every day and is listed on a roving chalkboard. It’s quite extensive and I’m sorry I didn’t record what we ate but suffice to say everything was delicious, including fish, pork, duck, etc. This is as close to nouveau Mexican as I’ve had. We’ve become friendly with Fernando, the owner of a fishing boat, and he met us at his friend’s seafood restaurant Rio Grande, (a couple blocks past Tino’s.) The crab tacos are to die for, as is the snapper sarandeado, at least as good if not better than Tino’s in it’s heyday. We needed a night away from Mexican food and Barcelona Tapas fit the bill. They serve an excellent Spanish style sangria and we enjoyed an array of dishes including tuna carpaccio, vegetable timbale, baked goat cheese, bacon wrapped dates, grilled octopus, grilled asparagus, and paella valencia. An absolute gem that I hadn’t noticed on LTH is El Arrayan, in centro, which serves traditional Mexican cuisine from all the varied regions. This extraordinary meal included Jamaica flower hibiscus quesadillas, chopped Yucatan pig’s feet served in tacos with jalapeno-pineapple salsa, green posole, duck carnitas with guajillo, orange, and arrayan sauce, lamb birria, and cochonita pibil. 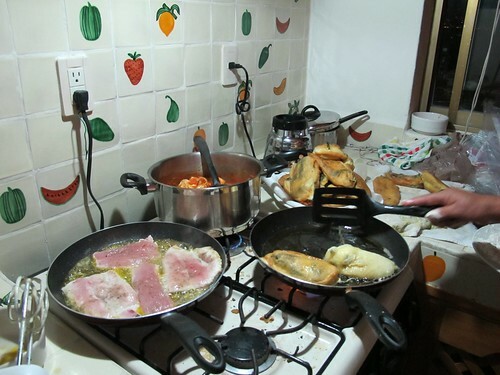 New Years Eve is always a feast in the condo with varieties of food carried in from the Malecon food carts including tacos, tamales, corn, pizza from Pinocchios, etc. We also grabbed a rotisserie chicken from El Pechugon and huge head-on shrimp from a local fish market we boiled to perfection in the condo. Xocodiva was a sweet finish. We always enjoy lunches on the beach but Fernando, our boat captain, turned us on to Tacon de Marlin, which has the PV version of burritos filled with shrimp or a combo of marlin and shrimp. Extraordinary! Nothing like Tex-Mex. There’s an outlet across from the airport and another somewhere in centro. Our last meal before the flight was our only breakfast and we very much liked Andele’s. I had the chiles en nogadas, which were good but a bit sweet for my taste. There were no pomegranate seeds on top so I imagine they always are available. They have great chilaquiles, and various egg dishes, but I the thought the best dish was the machata. The dollar is quite strong now in Mexico making everything from dining to shopping a great bargain. RevrendAndy wrote: An absolute gem that I hadn’t noticed on LTH is El Arrayan, in centro, which serves traditional Mexican cuisine from all the varied regions. 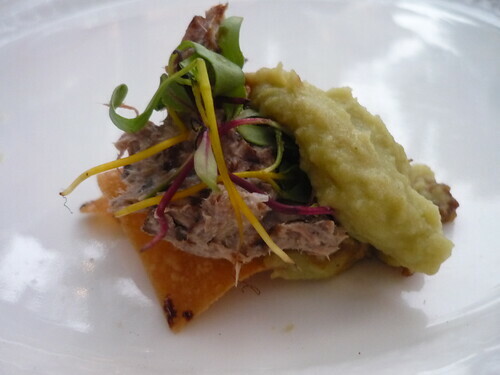 This extraordinary meal included Jamaica flower hibiscus quesadillas, chopped Yucatan pig’s feet served in tacos with jalapeno-pineapple salsa, green posole, duck carnitas with guajillo, orange, and arrayan sauce, lamb birria, and cochonita pibil. Glad to hear Cueto's continues in fine form. I've been working hard--but to no avail--to convince the Lovely Dining Companion that a return trip (to PV) is in order. Just one note: I posted on El Arrayan here and am virtually certain that I found the name from perusing the posts before me. It seems unlikely that we would have found it on its own. My only regret there was that LDC wasn't feeling well that night...ordering more would have been more fun. Still, we had a great time as it was and enjoyed the menu as well as the place itself. Yeah, I'm pretty sure that I posted on EL Arrayan before. Andy, I'm glad you liked it. I've found the food to be somewhat hit or miss, though the hospitality and service is always great. 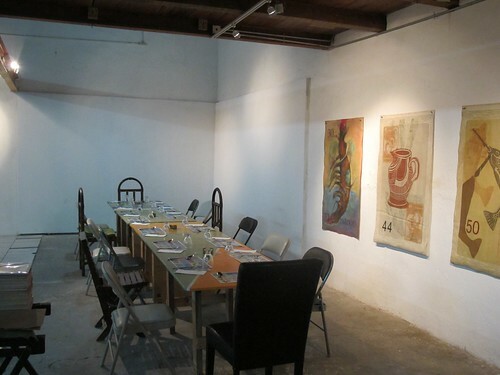 Just returned from 2 weeks in PV on Saturday... will report soon on our meals, including an underground dinner hosted by a local artist. So it's been a week since I returned from Puerto Vallarta and I'm finally getting around to my recap. We spent 2 weeks there, as we do every year. unfortunately, because of the size and composition of our group we don't get off the beaten path as much as I'd like and we tend to skew toward nicer places. I see the posts such as the tour above and am jealous because my wife is leery of eating from the street stands and won't even let me do so because she "doesn't want to have to take care of me if I get sick." Cafe des Artistes - Dinner w/ wife, my parents & cousin Sam. We had an incredible evening here, as we always do. PV and Highland Park are sister cities and my parents are on the Sister Cities committee, so they've been instrumental in the charity dinner that HPSC puts on every 3 years. This means they've become good friends with chefs Thierry Bluet and Hugo Ahumada (Hugo lived with them for a month when he staged at Carlos' about 7-8 years ago... next year, he's representing Mexico at the Bocuse D'Or) so we got a number of extra courses sent out and each came out to sit with us for 15 min. or so during dinner. Other standouts were the comal shrimp cooked tableside and the smoked tomato bisque. Thierry sent out a huge mirror w/ an assortment of deserts for us, including this flower pot w/ three kinds of mousse underneat the "dirt"
While we had a top notch dinner, we did hear back from others in our group (totals about 40 people) who went to Cafe on other nights and a couple had some less than perfect experiences, like tough beef petals and cold shrimp. Red Cabbage - Dinner w/ parents, 3 cousins from CA and one's 4 girlfriends. 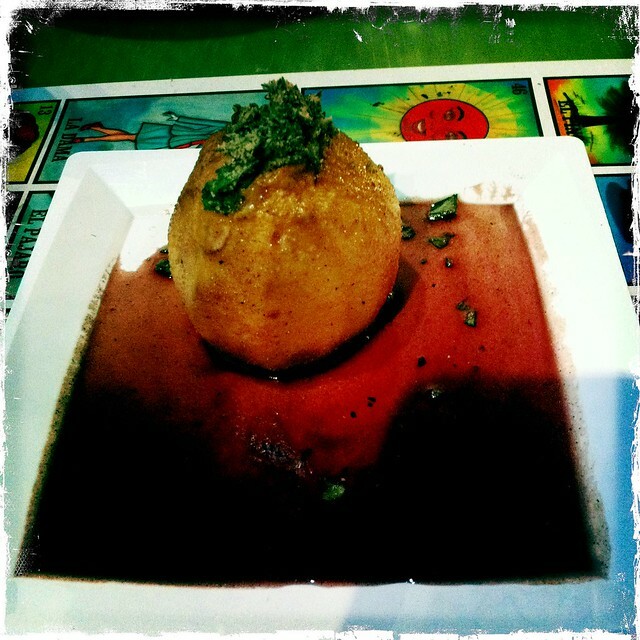 Red Cabbage is a favorite because they have the best mole I've had, so I dream about it all year. 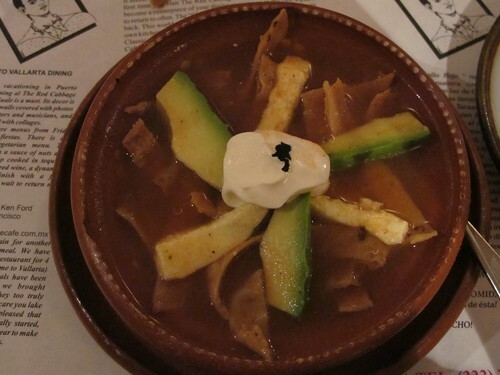 Excellent tortilla soup. 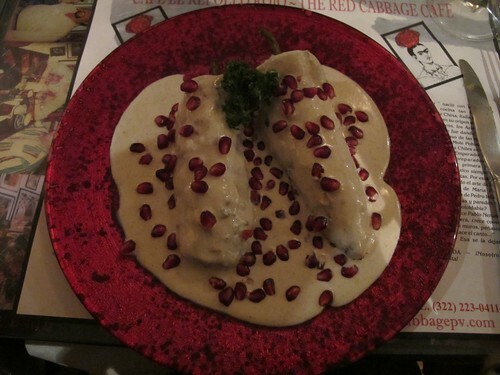 Their other specialty is chile en nogada, and their version is also the best anywhere. Cueto's - Dinner w/ wife, my parents & cousin Sam. Victory snatched from the jaws of defeat. We'd planned to go to this other seafood restaurant recommended by a local architect my Dad befriended. We thought they closed at 8:30, but instead closed at 6:30. We knew Cueto's was around the corner (and not much else in the area), so we headed there even though my Dad had thought he didn't like it the time we went many years ago. He was convinced otherwise as we had super fresh seafood and it was super cheap. My wife's whole grilled sea bass was like $12! I had the sea bass "filet mignon" where they roll it and wrap it in bacon. Coco's Kitchen - HP-PV Sister Cities dinner w/ about 50 people from the two cities' committee & families. Better than expected for banquet-style service (soup or salad, choice of 3 entrees, choice of couple desserts). Elote soup was OK, but could've used more spice. Beef with poblano cream sauce was surprisingly good and meat well cooked. I had key lime pie, which seemed like store bought frozen that they hadn't even thawed. 2 Con Todo Tacos - Wife and me. Taco stand she saw from bus and was deemed safe enough for her. 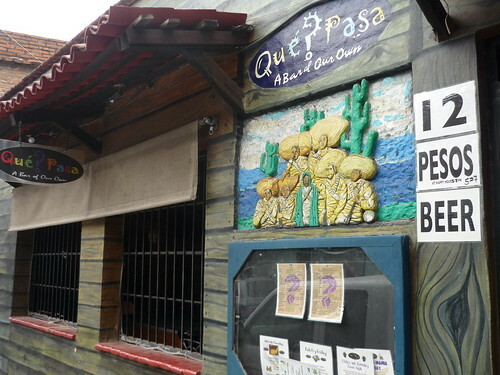 New, gringo-oriented tourist stop a block from Malecon. Tacos were nothing special. Al Pastor tacos were miniscule, though were just 10 pesos. Other tacos had more meat and cost more, but no standouts. I think most run-of-the-mill Chicago taquerias would've been cheaper and better. Trio - Dinner w/ wife, parents, cousin John (serious foodie from L.A.) Another restaurant where parents are good friends with the chef/owners, Ulf & Bernhard. This has been my favorite restaurant experience here each of the past 4-5 years. This year's dinner was favorite yet again. They were out of my favorite calamari appetizer, but the Shrimp & scallop appetizer was good (can't remember preparation) and the lamp chops w/ lamb ravioli were spectacular. Perhaps best lamp I've ever had and the ravioli have been a favorite since Ulf first sent out a sample while developing the recipe a few years back. Filling had a little cumin that almost reminds me of the lamb dish at Lao Hunan. New Year's Eve - We have a couple of the maids from the timeshare complex come in and cook a Mexican feast each year. They make salsa, guac, chicken in a red sauce, garlic mahi, chile relleno, chicken enchiladas, refried beans & Mexican rice. They charge us like $15/person, which includes shopping for the food, ingredients and all preparation. This year, I think we had 26 for New Year's. Our group just eats and then chills in one of the condos and then we hit the beach to watch fireworks at Midnight. Pipi's - Dinner w/ wife, parents as well as aunt, uncle & HS/College age cousins who all arrived. This new addition to our group sports limited palettes, so they wanted tourist trap fajitas. Wife wasn't feeling well, so we headed back to condo before drinks even made it to table... no loss in my book. El Barracuda - Same group as previous night. Casual fish/shrimp restaurant. Affordable, decent food. Coconut shrimp are good but rich. I had 1/2 ribs, 1/2 coconut shrimp. Ribs not so good. Las Adelitas - New Mexican/BBQ place by former owner of No Name Cafe, the Chicago-themed sports bar that was a Malecon institution for years. 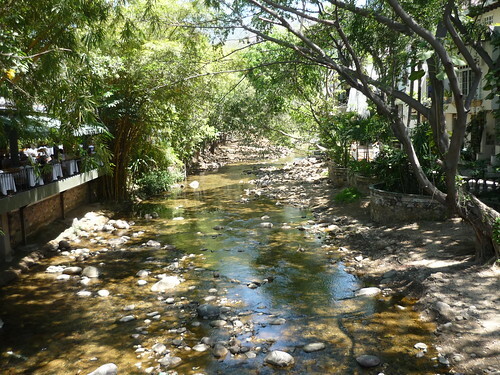 This place is located in Fluvial, west of Hotel Zone. Wife was still under the weather, so we & my parents carried in. BBQ spare ribs were quite good. Those who had the carde asada also raved about it. Awesome coleslaw and charros. Everything way better than expected. Wish this place was here because it'd be in a very regular carryout rotation. Hacienda San Angel - Wife, parents. Incredibly beautiful setting inside intimate B&B with incredible views of town. Like entering another world. 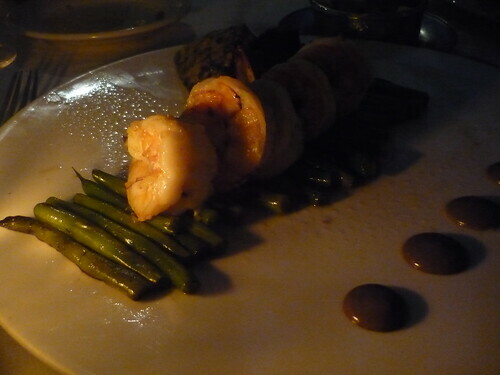 Food is very good, though not quite as interesting as Cafe des Artistes or Trio. I had an excellent fried calamari & split a chile-rubbed filet & a veal dish w/ my wife. On week nights, they also have a very high end mariachi band playing. La Piazzetta - Final night dinner w/ 23 from our group. This restaurant in Fluvial (across from Las Adelitas) is an offshoot of another location in the Romantic Zone. This location is always pretty dead, and it's close to our timeshare, which is why it works well for our bigger group dinners. Pretty decent pizza and pastas, and the service doesn't get overwhelmed even when our group was 80% of the customers in there. They deserve to be busier given the quality of the food. As I mentioned in my previous post, we had one truly unique dinner when we were in Puerto Vallarta. Thanks to my parents' involvement with Sister Cities (Highland Park and PV are sister cities), they've gotten to know many local artists. While shopping in town one day, my mom heard from somebody about an artist who did underground dinners to supplement his income from art. Later that afternoon, she bumped into one of the artists who had come to HP for Port Clinton Art Fair and Focus on the Arts at the high school and asked if she knew anything about this. 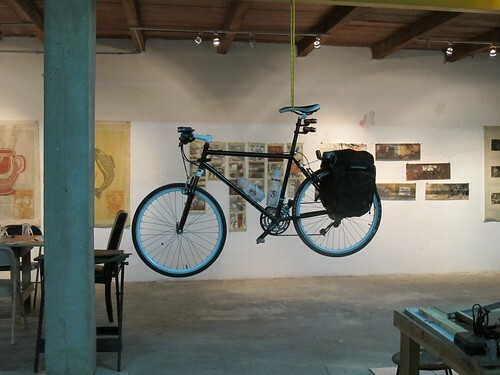 Turned out it was another of the group of artists who had come to HP, Fernando Sanchez. My mom got a hold of Fernando and arranged a dinner for us and another family who was in PV, who are also on Sister Cities. In all, there were 11 of us in attendance -- myself, my wife, parents, another couple, their daughters, son-in-law and 2 grand kids. 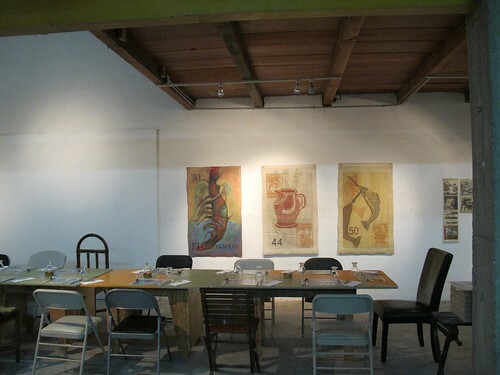 The dinner took place inside his art studio, which is located in the Southern part of PV, near El Brujo, La Naranja, etc. 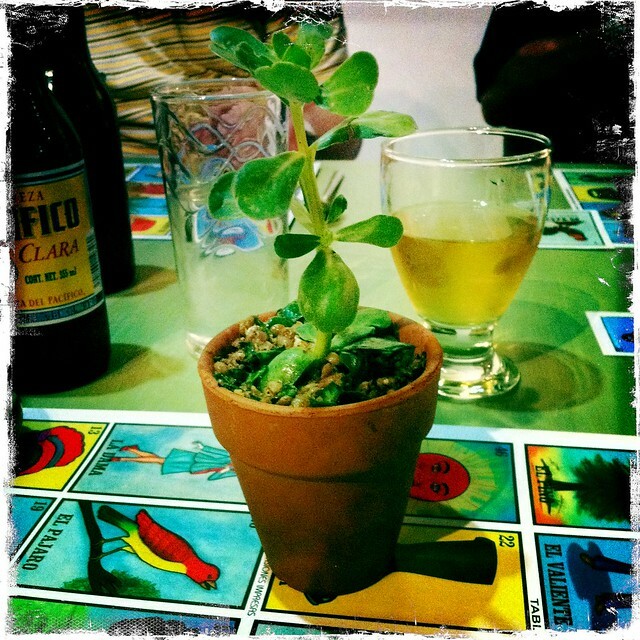 Fernando themed the dinner after Loteria, a traditional Mexican game similar to bingo with pictures of common objects and people. 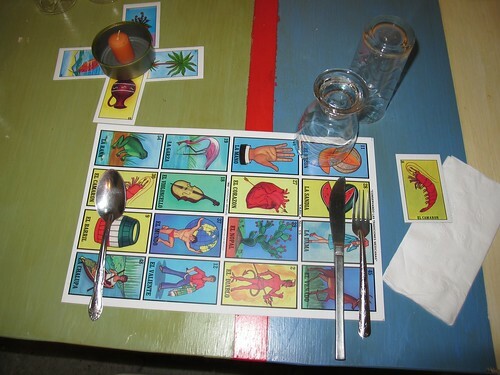 Game boards were used as placemats, while cards were scattered about for additional decor. 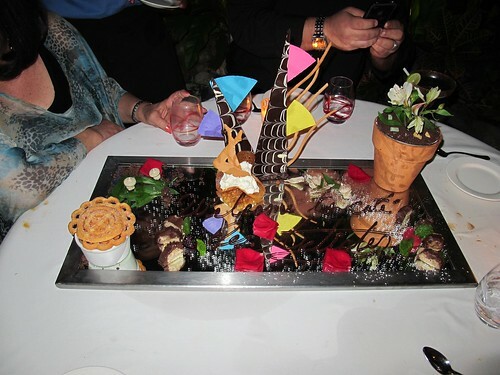 Each course was based on a card in the game. 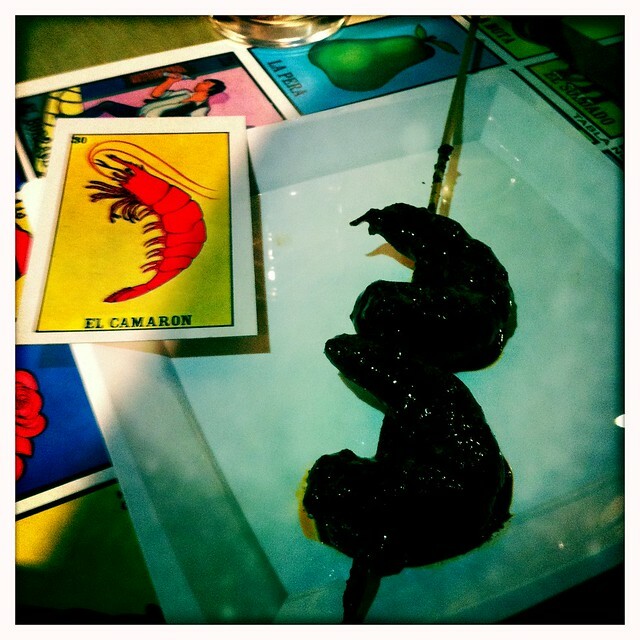 Two shrimp covered in a mole made by Fernando's mother that includes blackberry to give it a sweet tartness in addition to the typical smokiness and spice in mole. 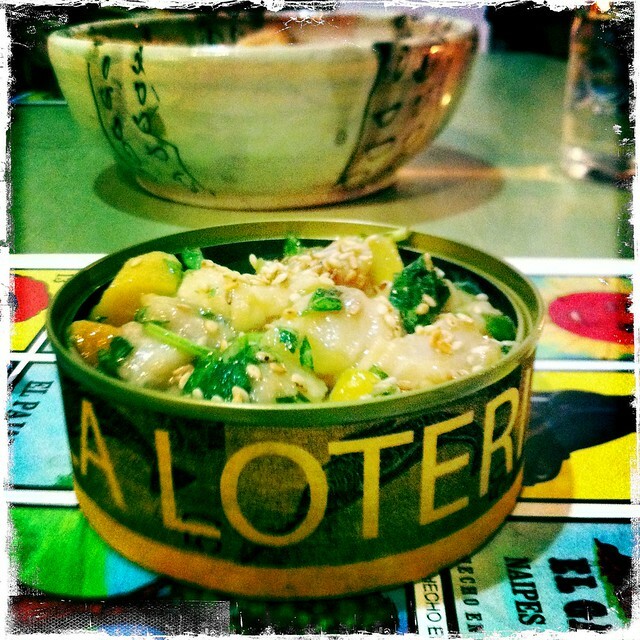 Spinach, lentils, goat cheese, almonds, pecans, walnuts, balsalmic vinegar. Fernando typically holds these dinners about once a month, or by request (not to so often as to get in the way of his art). 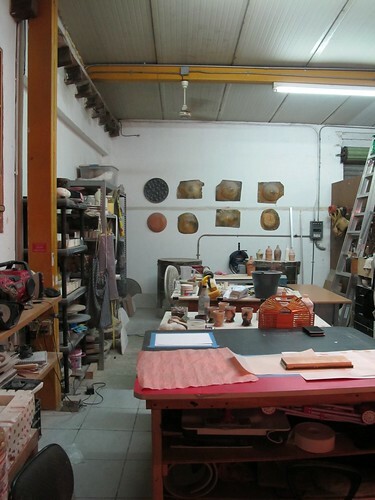 Studio is located at Jacarandas 370, Puerto Vallarta. Thanks to everyone for all the reports. 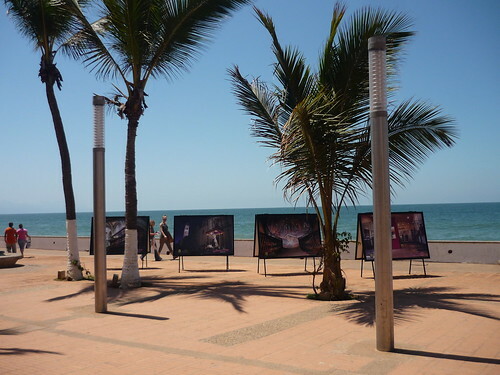 Puerto Vallarta is only a five or six hour drive from Morelia, I can see making the trip someday when we need a vacation (so far every day seems like a vacation but I know that will change, especially when I really start working next month). 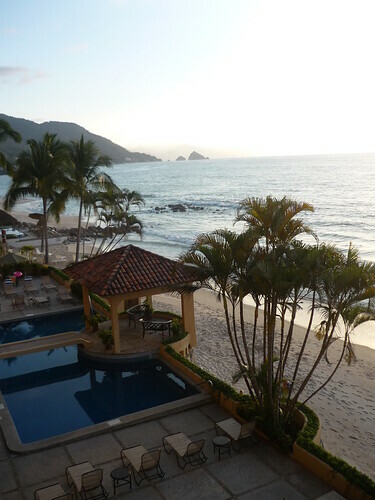 We really love Acapulco (in the same way we love downtown Vegas) but PV is way more accessible. The one impression I got from all the posts-man, they jack up the prices there. My love and I spent a restorative wk in PV celebrating my sister's bday. No stranger to a party (and in this case her own) big sis brought two bottles of vintage Dom (90, 98 - the 90 all brioche toasty and golden. Upon first sip, it rose to my greatest hits. Intel gleaned from LTH made the days even more memorable. First and foremost, SteveZ's taco tour extravaganza lives up to what any self respecting LTHer would covet- excellent food (for the most part) in excess. 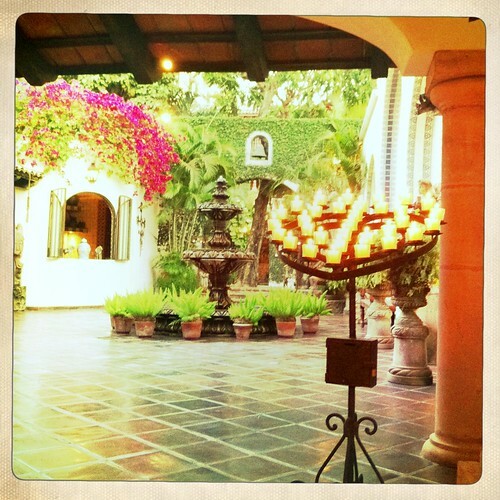 A walking tour based mainly in Old Vallarta aka the Romantic Zone included 10 stops in around 3 hrs. Highlights were Carniceria Colin (already well documented by SteveZ) where we sampled the most unctuous pork cheek in captivity. Serious flavor and mouth feel. For me, a 10. 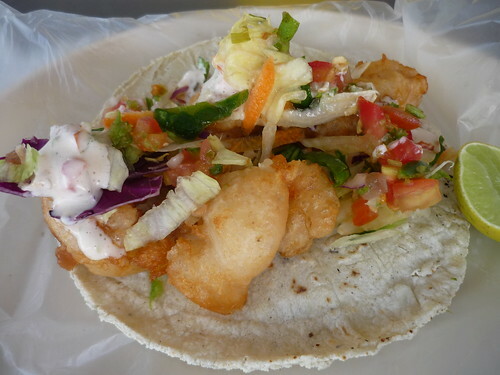 Right up there as well was a fish taco from a shack in Centro called Marisma. They have 3 locations but this is where it started over 20 yrs ago. Mahi (which I normally can't abide because of memories of S.Fla earlybird specials) was lightly battered and perfectly fried. Served w/accompanying shredded cabbage, salsas and guac on made in front of you tortillas, it was pescate al sabor. No easy task w/a fish I don't normally like. Tortillas, whether handmade by maidens or squeaked out of a machine were highlighted as well. Jugo de naranja from a sm fruitaria helped combat the heat (although not like what I understand you were enduring in Chi the last few days). Some beef birria w/a chaser of intense consommé and a mariscos tostada kept the home fires burning. We were beginning to lose our appetites. Machete a young coconut for it's agua to drink with it's soft meat pried from husk, dusted w/chile and lime and you're good to go. Walked to the beach and finished w/some grilled marlin and camarones that segued into a candy store for one last bite of pan dulce slathered w/goat milk caramel sauce aka cajeta that takes it's origin from the state of Jalisco. Numb from food coma, we staggered el Malecon back to our condo to recuperate for mas comida mañana. Que suave. Another day we went in search of zarandaedo. Warned about the new Tino's time share shill while you eat on the Malecon, we opted for Rio Grande (as read about on these pgs). Probably the best single piece of fish consumed on our trip (and the salsa as well). The crab tacos were an abomination though, back fin @ best w/a melted yellow cheese that reminded me of Kraft singles. Basura. 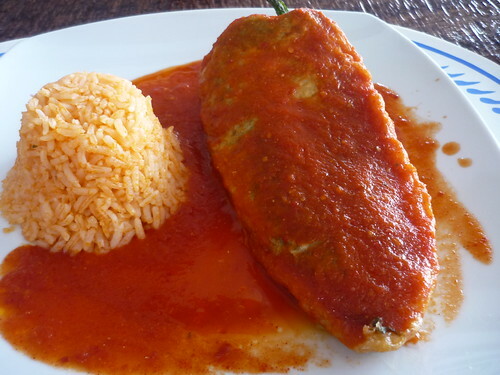 Very respectable chile rellenos though. Lastly, when we met Eric, the guy that runs the Vallarta Eats taco tour on Insurgentes bridge, we began kibitzing. I asked for an off menu best of best rec. 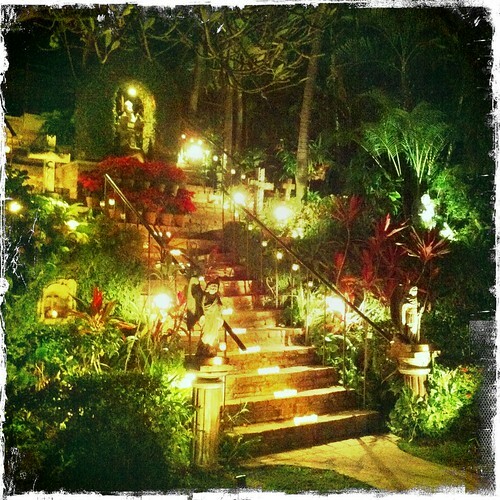 Without missing a beat he suggested a new place past Mismaloya in Boca De Tomatlan called the Ocean Grill. A restaurant and beach club that opened about 7 mos ago. In spite of the distance via two auto buses and the hot humid tropical depression weather, it was well worth it. Reservations are needed. They pick you up @ the dock in a small boat for a 5 min ride to the property. Gorgeous. The food was quite good as well, excellent grilled octopus, more fresh mahi (not quite as delish as the fish taco) but killer ambiance. Reminded me of Nikki Beach Club in S. Beach and Ibiza. 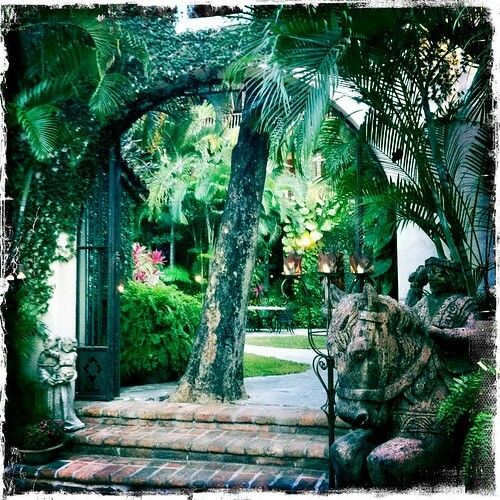 Great vibe, excellent food, beautiful surroundings… what more could you ask for? We ate, took advantage of the private beach, hung @ the bar bullshitting w/one of the owners Alfanso and Wilson, his huge Great Dane puppy and in general had a most wonderful time. A great experience and highly suggested. Though I tried to get there myself, it was time for me to leave. So the ladies went on their own to El Brujo where they reported back another wonderful meal. While they didn't order the stuffed fish mentioned in these pgs, they did order a wonderful chicken dish they both loved. When pressed for a better description, they just laughed and said it involved queso and I suspect, some margaritas as well. Also recommended by the Vallarta Eats honcho was his favorite dish there, arrachera (flank steak) served in a molcajete (a Mexican mortar carved from volcanic stone). More cheese, some chorizo etc… he loved it, as did they. In all, a wonderful trip, made all the more so by LTH Forum. Gracias amigos. After a wonderful four days in Aguascalientes celebrating my cousins wedding the entire side of my moms family and some friends of my cousin the groom got on a bus we rented and headed for Puerto Vallarta. I think there were 41 one of us. It was quite a relief when we arrived after the 8 hour drive and I'll never forget how the bus driver was able to maneuver around town down some of the smallest old world streets as he dropped folks off one by one wherever it was they were staying. If I was full of money I would of hired him as my driver there on the spot. Point of my non food story? Most of the people in Mexico are great folks, be not afraid. But be safe just as you should in the streets of Chicago. Me, my immediate family and a couple of cousins stayed up the mountain in Punta Negra. We had a really fantastic place on the beach that came complete with a pool and personal chef and staff. The owner of the place down to the helping hands were great. If you have a couple families or a big one going down I'd recommend Casa Patty out. I hadn't been to Mexico in some time. Freshman year of college spring break we had an interesting experience that still makes for a great story today and I was kind of turned off. Not just at the attempted blackmail threats made by placa but also because Cancun is just a dump of large resorts with places focusing on cheap all inclusive garbage in which case you get what you pay for. Lesson learned? Stay away from Cancun it's our Daytona Beach. Staying in Punta Negra worked out great because we had an amazing beach to ourselves in the backyard and town was just a short bus ride down the hill. Before I left I knew I was in good hands as far as food goes but in all honesty this thread is so damn useful it was almost too much. Every time I tried to read thru it I ended up over in Pilsen or somewhere else eating Mexican food before I could write some places down . So I just kind of went at it as I walked around. Needless to say as I was reading this before I wrote this report I saw this place below in a picture as one of the good inexpensive joints in town. I concur and just like the tipper said it's a great place near the bus stop where you get off at in town. Enjoyed by local Mexican folks and gringos in the know. I ate here everyday I was in PV (five to be precise) and even recognized the cook in Silas Jayne's pics upthread. You know the seafood is fresh because one of the popular fish markets in town is a few feet down and the cook goes over there to grab fish and shrimp as needed. Nothing fancy here but the perfectly battered seafood served in a warm tortilla with a slurry of sides for you to dress as you please tasted grand. Served with cheap ice cold Pacifico these tacos hit the spot each and every time I ate them. 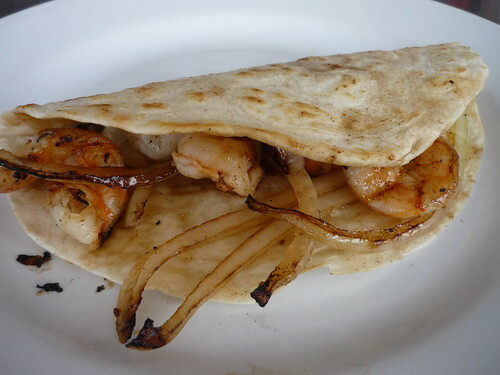 The shrimp in particular were fantastic and whenever I get the crave which I still do I'll go to La Lagartija Taqueria for something close but not quite as good. I noticed what seemed to be like alot of expats or regular wintertime wanderers eating here along with locals headed to or coming from work. It lived up to the looks. Since we had a chef and all that I did alot of eating at our rental. I forget her name but she was great and must of learned well from her mom. Each meal requested whether it was fried whole fish like her mom used to make or comfort favorites like chilaquiles for breakfast and chile rellenos for lunch it was all good. She made some of the best damn Nayarit style garlic shrimp I've ever had. We had her make it a couple times after asking for her favorite or signature recipe she likes to make and eat for herself. One of the days spent there was on a big boat that we rented (Captain included) and took out to a popular snorkeling area. Nothing special as far as food goes on the boat but our guide was great and we had a blast drinking and singing awhile enjoying good times. We've gone on some great family trips with virtually everybody on my moms side (One of Seven girls) over the years from renting a house boat in Kentucky to renting a bus driver and touring Ireland. This was one of the funnest. 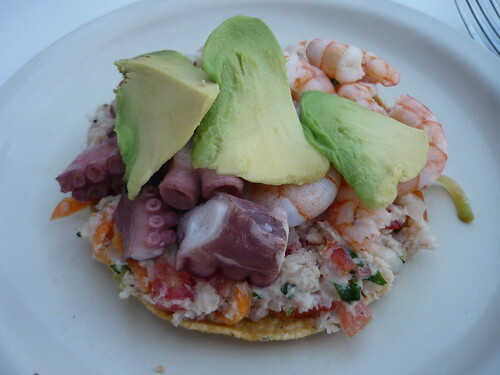 So even though some family members weren't into eating seafood in Mexico we gave Mariscos 8 Tostadas a go. I wasn't scared and those of us that weren't were rewarded with some good eats, especially after a day in the sun. 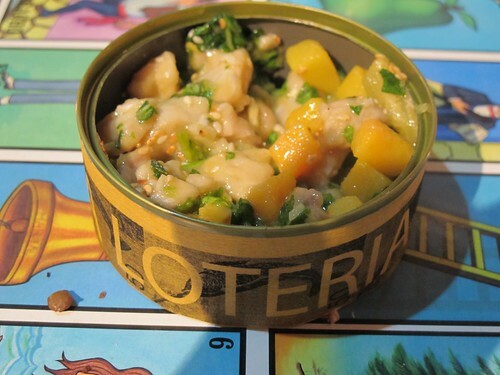 Fresh cold seafood dishes work great and that's what they do here. 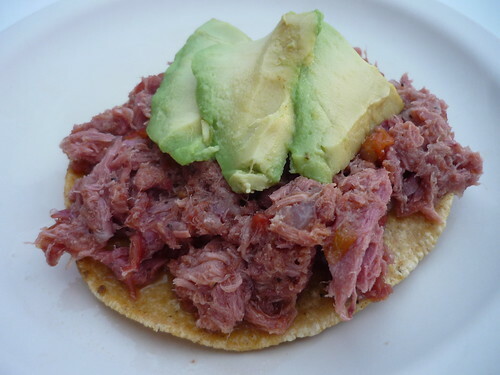 you can get many different varieties served on a tostada with an assortment of salsas. I liked this place and would go back again no problemo. Nice place to eat at if your staying near the marina or doing any activities there. I spent alot of time just walking around and stopping in at different bars for a beer and of course worked up an appetite while doing so. There was one intersection that I mentally noted as "chicken square" as they had a two grilled and one rotisserie cooked bird shops on three of the four corners and it always smelled great around there when walking by. 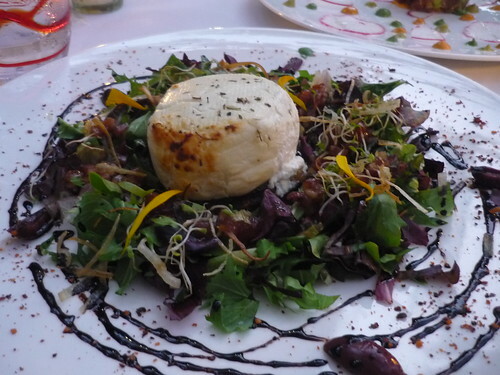 We also had a chance to get a fancy meal in and my sister chose Café des Artistes as our spot to splurge out at. 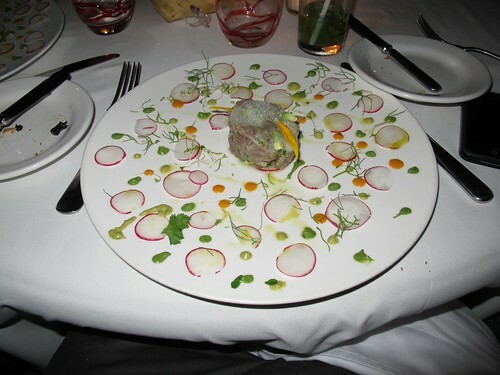 We had some good well executed food made with fresh quality ingredients as was expected. 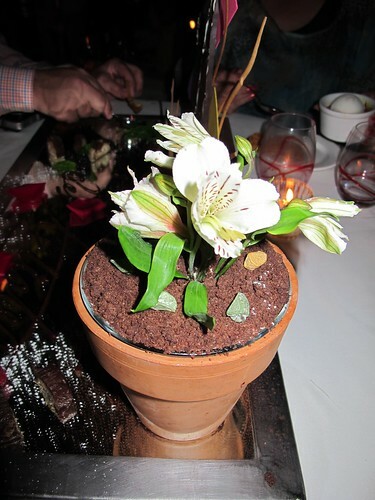 The dining experience as a whole was really top notch as far as service and atmosphere goes. Very nice outside seating. We started with gratis short rib nachos and I thought that was a little off as far as fancy food goes but it was free and they were good. Highlights as far as app's go were the Baked Goat Cheese "Crottin", Octopus Carpaccio, fresh Tuna Tartare and Confit Duck Chilaquiles. It got dark and I couldn't get any half decent pics of our main entrees but the shrimp au comal, lamb osso bucco and a few of the specials were fantastic. Beef, splendid post as always...and very timely. I'm leaving for my annual PV trip on Saturday. I recognized a few of the spots pictured as places I have either visited or plan on visiting one of these days. Even after all the times I've been there, I still have a backlog. That's one of the things that keeps me going back. I know the exact "chicken square" you're talking about. 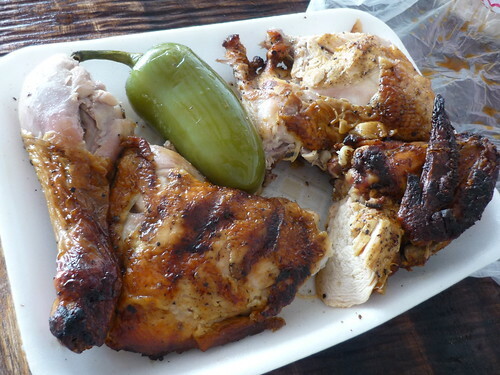 I've only had chicken from El Pechugon, because I struck up a conversation with the lone cook one day and it just became my place. 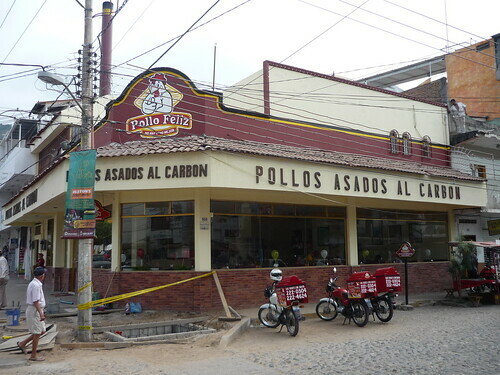 I'll have to check out Pollo Feliz this time because that chicken looks real good. This is the part that kills me about PV even today. They're recycling their plates and using cheaper bags, which kinda makes these guys cleaner and more environmentally conscious than all the street tacos in LA. and I still clearly remember checking out El Moreno. Decent taco. I’m back from my annual trip to Puerto Vallarta. This year, I was slowed down a bit because I was recovering from some minor injuries I sustained in a car accident just before I left. As a result, I didn’t get out as much as in the past, but besides visiting some old favorites, I did manage to hit a few new places. 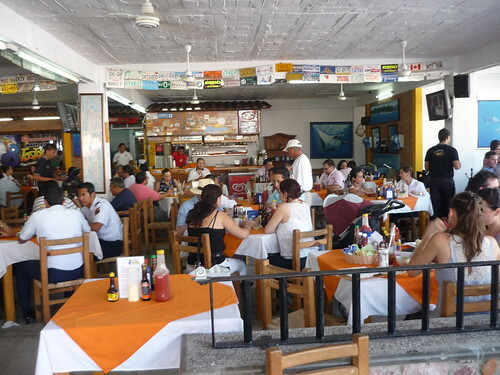 One of those places is Cueto’s, a small seafood restaurant run by the very hospitable Peña family. It’s slightly off the beaten path, located in back of the athletic fields on the north side of the downtown area. 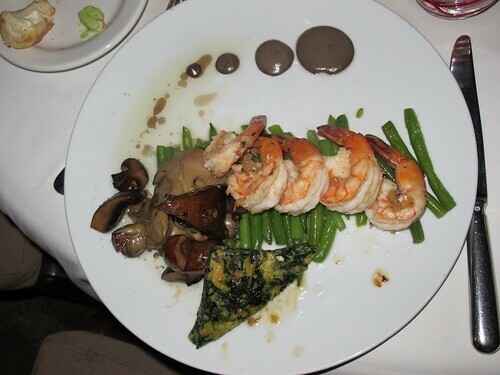 Cueto’s features fresh seafood that is brought to your table on display as if you are at a steak house. They are justifiably proud of their seafood, which is fresh from the boat every day. The service couldn’t be any friendlier if it tried. 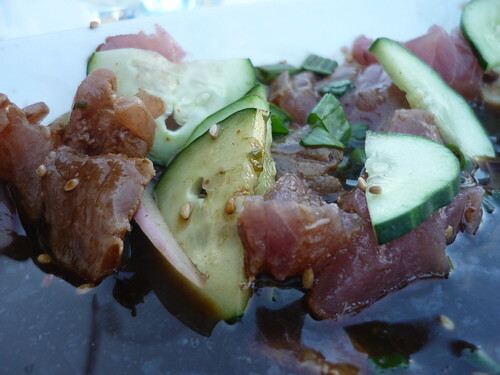 If you order carefully, Cueto’s will satisfy your seafood itch. What do I mean by order carefully? Well, Cueto’s is really a tale of two extremes. 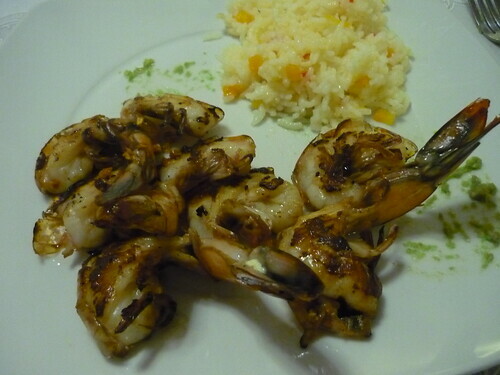 The fresh, grilled seafood items, such as the shrimp pictured below, are great. On the other hand, ordering anything with a sauce can lead to a plate that more closely resembles a bowl of soup than an entrée. Not feeling quite up to eating a whole fish sarandeado style, I ordered this snapper filet with “Spicy Chili Sauce”. What I got was what you see above. Basically it was a nice fresh fish filet completely drowned in something resembling Campbell’s Tomato Soup with a bit of cayenne thrown in. I’d happily return to Cueto’s with the caveat that the simply prepared dishes are the way to go. We had a great Thanksgiving dinner last year at Coco’s Kitchen, and we were ready to go back again, but I heard about another place that went all out for Thanksgiving dinner and I had to try it. 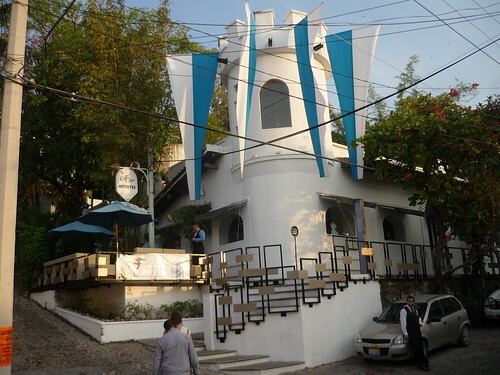 Gilmar is a restaurant hiding in plain sight near the Insurgentes Bridge. Normally, it’s a small restaurant serving typical PV fare that caters to the US/Canadian expat community. No tourists and no locals. It’s so off the radar that three different cab drivers had never even heard of it, yet it’s right there in the Gringo Gulch area. They are known for a roasted salsa molcajete that they prepare tableside to your specification as soon as you are seated. For Thanksgiving, they transform the restaurant into something resembling your grandmother’s house. For the princely sum of $16 US you get the Thanksgiving dinner all-you-can-eat full monty. Mashed potatoes, sweet potatoes, green bean casserole, tequila cranberry sauce, veggies, stuffing and homemade rolls served family style, and turkey carved to order tableside. 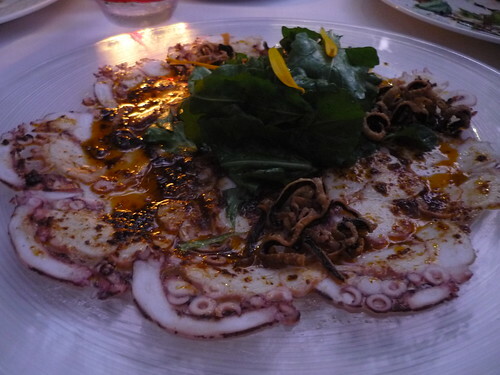 The thing that impressed me about Gilmar is that it is truly a neighborhood restaurant. Everyone from the staff to the customers seemed to know each other. As people would come in to pick up to go orders, they would run into friends who were dining in and would sit for a while and enjoy a drink and conversation while their orders were being prepared. I didn’t have a chance to go back after Thanksgiving to try their “normal” offerings (especially that salsa maolcajete) but I’ll definitely be there on my next visit to PV. Perhaps the culinary highlight of this trip was Rio Grande. I can safely say that Rio Grande has supplanted Tino’s in my rotation (Sadly, Tino’s has become little more than a tourist trap on the Malecon). Their pescado sarandeado is outstanding. So good, in fact, that we actually went here twice. On our first visit, we went all out to sample quite a bit of the menu (OK, there were only two of us, so we couldn’t sample everything). I started out with their “famous” shrimp empanadas. These were OK, but not something I need to rush out and order again. These went very well with the house made salsa molette, which is the almost Asian chili oil-like salsa that is so prominent in the area. Rio Grande’s version packs a real punch and is among my favorites. For my main, of course, I had pescado sarandeado. Rio Grande cooks their's over an open air wood fired grill that is built in to the storefront next door. You can watch them cook from the street. This is an excellent version of this iconic dish. It harkens back to the glory days of Tino’s, when they were located in Pitiyal. It’s perfectly marinated and spiced, with a gentle but deft hand with the spice rub. 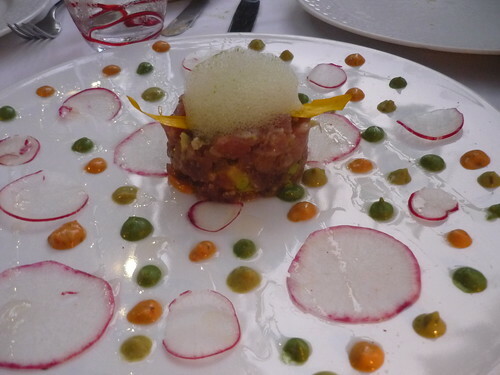 Topped with some of the salsa molette, this dish was one my most memorable bites ever. If you’re a sarandeado fan, don’t miss Rio Grande. The Chow Poodle ordered lobster, which was also very good, but clearly the pescado sarandeado was the star of the night for both of us. Of course, we managed to choke down the lobster, too. We had a nice conversation with several members of the family that runs the restaurant and they sent out some decent flan for dessert. A few nights later, we went back again. I was feeling a little under the weather, so I ordered a small bowl of caldo de mare as an appetizer. Wow! is all I can say about this soup. I wasn’t really expecting much, but was I wrong. The caldo was chock-a-block with shrimp, octopus and snapper; all in a rich slightly spicy broth. To go along with the caldo, we ordered pescado sarandeado for two. Once again, this dish didn’t disappoint. Our first visit wasn’t a fluke. This place is the real deal! All in all, another great trip to PV, including a trip to the vanilla store to stock up. One other bit of news, Xocodiva has moved from their old location on Rudolfo Gomez to a new storefront on Basillo Badilla just up the street from Café de Olla. Seafood pix in particular, stevez, are fabulous. Still haven't sampled any street-side tuba yet, have you? Laikom and I spent an impromptu five days in PV a few weeks ago. We ate a ton of food, some of it great and some of it just short of abhorrent (resort food: ‘nuf said). Thanks to the advice of the forum, we had a life-saving meal at Rio Grande and enough sun and margaritas to wash away our troubles. Among the highlights of the trip were our two meals at Tacón de Marlin. 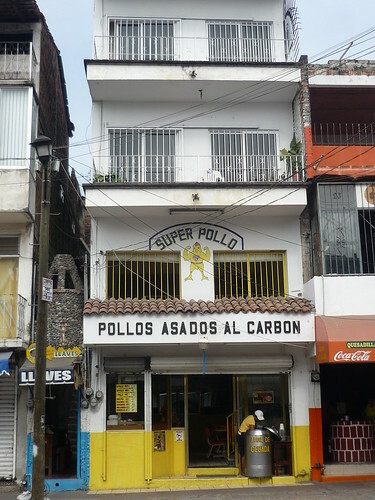 Laikom found the place through a Spanish-language internet search for “what locals eat,” but it is also well-documented on Trip Advisor. 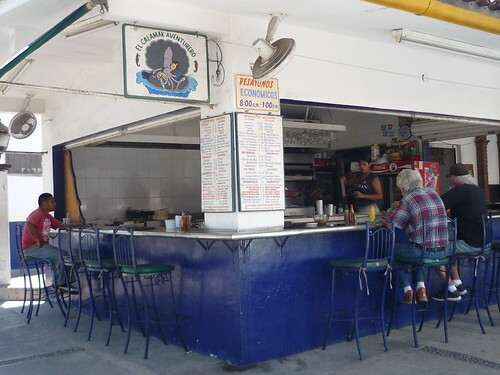 Tacón de Marlin has at least two locations, the original next to the airport and another on the north side of PV, at Calle Honduras and Calle Peru, one of the city's main thoroughfares for northbound buses. We visited both during our stay. Despite earnest, albeit grade school-level Spanish inquiry, we have no idea where the term “tacón” comes from. Does it refer to a person? A type of purveyor? Or the signature food? From what I can tell, a tacón is something like a stumpy overstuffed burrito. They run from $5-8 each, which ordinarily is pricey for a burrito, but quite reasonable for one stuffed with fresh seafood. We first split the signature smoked marlin tacón. It comes with refreshing sides of jicama salad and pickled cucumber and peppers, spiced generously with oregano. Of the four salsas offered, our server made sure to point out to us gringos which two were “picante.” All four salsas were distinctive and excellent, and I found myself routinely rotating back and forth from picante to mild, so that the heat would not prevent me from shoving food in my mouth as efficiently as possible. Besides seafood, I’m not really sure what they put inside a tacón, but there must be unicorn blood based on how magical they tasted. After inhaling our first taste of tacón, we ordered two more, one with octopus and the other with a combination of shrimp and sea bass. (Our server looked at us incredulously: “Dos?” Si. Dos. 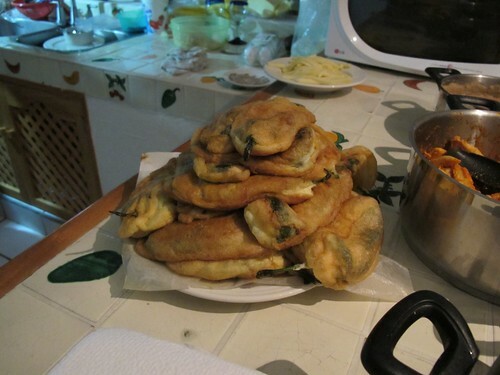 We did end up taking some home for late-night snacking.) All were worthwhile, but the smoked marlin was clearly the main draw. If you are familiar with the PV airport, you may or may not know - I had never noticed - that there is a pedestrian bridge over the highway directly to the south of the terminal. 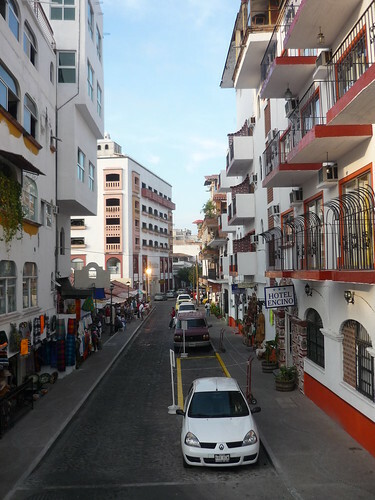 The original location of Tacón de Marlin is just on the other side of that bridge. (Evidently, there is a taxi stand out front that purportedly has cheaper fares than the taxis directly from the airport. Hmm...) It is a perfect stop just before or after a flight. On our way out, we checked our bags and then sauntered over to Tacón de Marlin for a leisurely lunch, and then took some carryout to wait at the gate. We breathed a sigh of relief when our tacón made it through the metal detector without incident. Check out the tacón on a beach chair in the background! I <3 photoshop! 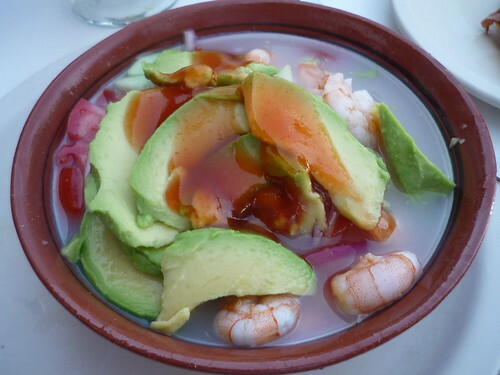 We had many other memorable meals, including some fantastic street food, while in PV, but this is the one experience that we felt compelled to share with the board, post-haste. Tacón de Marlin is worth seeking out! 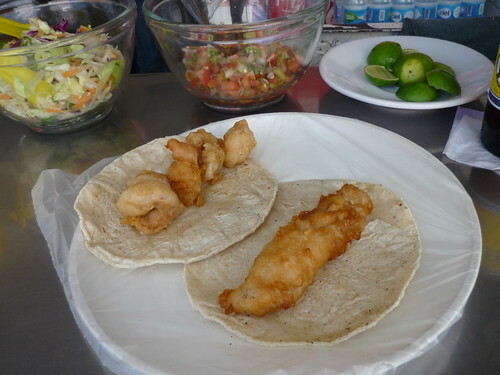 When we went to PV a few years ago, we stopped at the airport location of Tacon de Marlin. I'm not sure how we found it -- my food travels are usually LTH based. I do remember thinking it was a great pre-flight stop. Aha! So, by extension of logic, La Pasadita's Ultimate Burrito could more or less accurately be termed a "burron"? Great post, Teresa. That marlin trompo is a thing of beauty. Did you happen to ask what the difference between the mixtos and cambinados was? fropones wrote: Great post, Teresa. That marlin trompo is a thing of beauty. Did you happen to ask what the difference between the mixtos and cambinados was? Uh, clearly the difference is 1 peso. 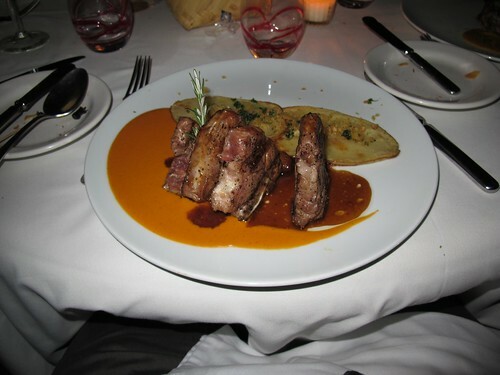 stevez wrote: For my main, of course, I had pescado sarandeado. Rio Grande cooks their's over an open air wood fired grill that is built in to the storefront next door. You can watch them cook from the street. question Steve: they use snook, right? for the sarandeado? Usually pargo (bream) or red snapper, though snook is also used. It depends on the chef (and the catch, I imagine). Whenever i see the type of fish listed on the menu, it is huachinango, which is red snapper. The best type of fish zarandeado I've had was at Tino's a few years ago, they were out of the snapper and served a very thick slab of Dorado (mahi-mahi) instead. Being thicker, it still had a nice crust but the flavor didn't fully penetrate, leaving delicate mild fish in the center. I want that again. I should have asked if they could make it for me during my most recent trip, but didn't even think about. Pacific menus usually do say huachinango sarandeado, and huachinango is red snapper. However, red snapper is an Atlantic fish that is most common in the Gulf of Mexico (eg, huachinango Veracruzano) and does not exist at all on the Pacific coast. So it's usually rockfish. More confusingly, pargo is always actually snapper in Cuba (where it obviously is native) even though pargo denotes sea bream in other places, including Mexico. Heading back to PV in about 3 weeks... any new places to check out? Our family friend, who had been executive chef at Cafe des Artistes, left a few months ago and just opened his own restaurant in the Romantic Zone called Maia... we're excited to try it. He appears to be doing a menu that's much more rustic and Mexican that what he was creating at Cafe, and focusing on what's available/freshest daily. I just got back from my annual PV trip. I hope to finish a long post soon. I think I saw Maia while I was walking around. I'll have to check it out next time I'm down there. Anxiously awaiting your reviews, Steve. 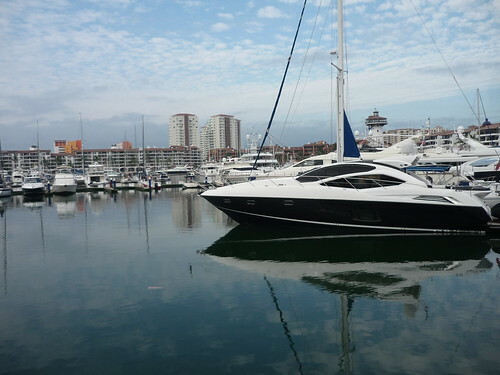 We leave for our month in PV the end of Jan. I will definitely check out Maia.